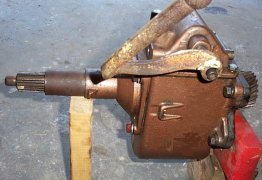 What is the Creeper Transmission? 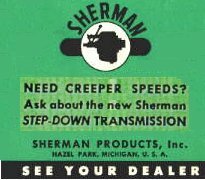 Following the popularity of the Step-up/Step-down Combination transmission was the Sherman “special purpose” or “creeper” single Step-down transmission. The “creeper” transmission uses the same gear case as the combination transmission but uses a top cover with only one shifter rail. It was painted a copper or bronze color as opposed to the gray or red of the combination. It was an extreme step down with a 9:1 reduction ratio and is a very rare find today. Externally, it uses the same shifter lever as the combination transmission. 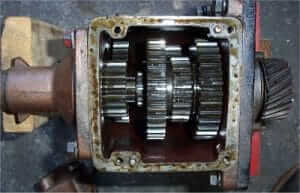 Internally, the creeper transmission uses all straight cut spur gears. All other models have helical cut gears.